You guys - when I first saw this sweater a couple of months ago it gave me ALL the feels. I mean, who gets like that over a sweater?! Apparently, I do. At the time it was sold out everywhere and I had a few good pouts over it and moved on. Then I went to check again a few weeks later and lo and behold, she was back in stock, and you better believe I made her mine as fast as I could! It definitely runs on the larger side, and if you size up too much could turn into a total tent. The moral is size down! I would have taken this in an XS if it had been in stock when I ordered. Anyway, I love this top and wear it at least once a week. It's so easy to throw on with some leggings and go, while still looking totally pulled together. Speaking of leggings, since it is basically -58 degrees here, does anyone have any good recommendations on fleece-lined ones? My fleece ones are all biting the dust very quickly, which perhaps could be a sign that it's time to wear jeans again? Let's be serious, that's not happening in this weather. If you see me in this top everyday, promise not to judge, because if you grab it too you will love it just as much! Super cute top lady and I love the necklace and shoes. Such a fun casual top! Perfect to throw on and instantly look cute. I totally get you on the feels with this type of sweater, I am equally obsessed with it! Love this classic look! And of course the bag and shoes too! Love the sweater! Also, your hair looks great like that! 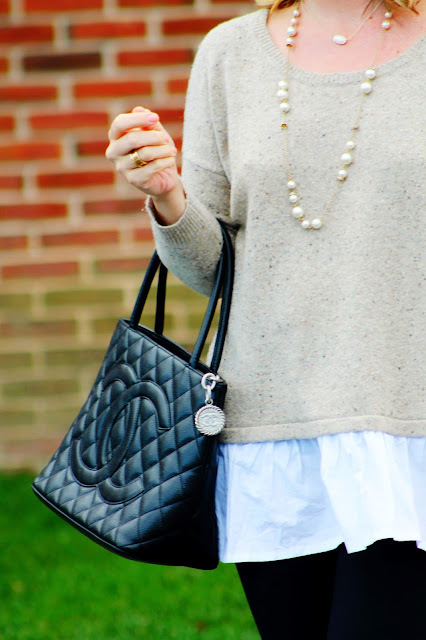 Love that sweater and your flats! Such a classic look! I'm going to be stalking your comments for fleece-lined leggings recommendations, it's sooo cold out right now! And those flats - love!